I made these Recipe Books for a Craft Show, but they would make great fast and inexpensive Christmas Gifts too. You could even make one for your mother and ask her to put all her favorite recipes inside for you; that way they'll be passed down from generation to generation. The size of the book is 4 x 6. The front and back covers are chipboard. I bound them together with my Bind-It-All using 3/4 wire. I used Stampin Up! 'Brocade Blue' cardstock for the cover and tabs. I made the tabs with a tab punch. A 'Ticket - Corner' Punch was used on the main image and red panel. Ribbons and brads were added for embellishment. Designer paper is unknown. I used three stamp sets to complete this project, the sets are from 'See D's' and 'Stampendous'. The image was colored with copic markers. There are 4 categories in this recipe book. 'Appetizer, 'Side Dish', 'Main Dish', and 'Desserts'. Each category page has a 'pocket' where additional recipes can be stored. These pocket pages were made out of cardstock. I scored and folded the bottom of the cardstock, and put a thin strip of glue on the right side, the Bind-It-All Wire closed the left side of the pocket. 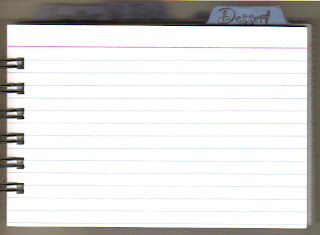 The rest of the pages are 4 x 6 index cards. I actually have a Stampin Up! 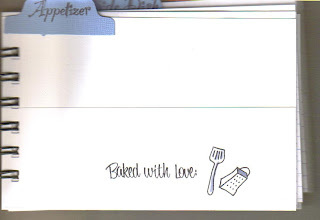 Recipe Card stamp that I would have preferred to use in place of the index cards, but it would have been too time consuming for a craft show. The Featured Stamper on Splitcoaststampers this week is Speedystamper. What an amazing gallery she has! I loved so many of her cards, I couldn't decide which one I wanted to case, so I did two cards. The first card uses Stampin Up!s retired set "Noble Deer". Even though this image is not my personal style, its a great image for masculine cards. We have so many deer hunters where I live, so I use this image a lot, and the guys really appreciate it. Speedystamper's original card can be seen here: http://www.splitcoaststampers.com/gallery/photo/974293?cat=500+ppuser=646. I kept the same colors and layout, but I eliminated the tearing, moved the twine to the bottom of the card and did a different treatment with it, and I also added more color to the image. The cardstock colors are Stampin Up! "Chocolate Chip", "Hunter Green", "Close to Cocoa" and "Naturals Ivory". I colored my image uses Stampin Up! 's Watercolor Crayons. The twine I purchased at Walmart. The edges of the Ivory Cardstock were sponged with 'Chocolate Chip' ink. The second card uses Stampin Up! 's "Inspired by Nature" set for the main image, and the sentiment is from 'Upsy Daisy'. Speedy Stampers original card can be seen here: http://http://www.splitcoaststampers.com/gallery/photo/1009342. I changed everything about this card except for the main image and layout. The cardstock colors are 'Kiwi Kiss", and an unknown purple from Michaels, and Georgia Pacific White. I used a variety of unknown, miscellaneous inks, but also Stampin Up! 'Kiwi Kiss', and 'Chocolate Chip'. I added dew drops, Hodgepodge Hardware, and Ribbon for embellishment. The sentiment is mounted up on dimensionals. Perhaps some of you might remember this card I posted about a month ago. I submitted it to my local scrapbooking store in Eau Claire for a 'Halloween Card Contest'. The customers of the store voted for the winner, and they chose me! Yippee! The store owner said the voting wasn't even close! I was so surprised to win. I thought there were so many cards better than mine. The customers don't know whose card is so whose, so the voting is always fair. I won a $10.00 gift certificate to the store. I used my gift certificate to purchase a new Inkadinkado stamp set. Yes, new rubber! Patter Cross's Challenge Word last week was 'Serve'. On her blog, 'Triple the Scraps', she asked us 'what exactly is 'service'', and quoted the scripture from Exous 3 11-12: "But Moses said to God, 'Who am I, that I should go to Phararoh and bring the Israelites out of Egypt? And God said, "I will be with you.' It has always comforted me throught my life, that God will never ask us to do anything on our own, or in our own strength. He is with us wherever we go and whatever we do, especially if He asks us to serve Him in ministry. For my card, I used my computer to create the sentiment 'God is with you'. I used the colors from yesterday's color challenge on Splitcoaststampers: Stampin Up! "Pixie Pink', "Tangerine Tango', and 'Kiwi Kiss'. The image is Stampin Up! "Upsy Daisy'. 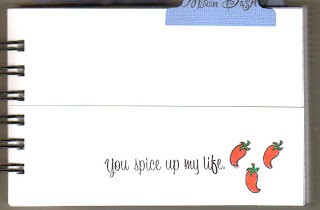 I stamped the 'Tangerine Tango' background cardstock in Versamark with the retired Stampin Up! 'Petite Print'. I used my cuttlebug to emboss the 'Kiwi Kiss' and 'Pixie Pink' panels. The main image panel is mounted up on dimensionals. I added ribbon and dew drops for embellishment. This weeks scripture challenge word is 'Encourage'. Come play along with us! Its a great way to really think about God's word and what it means to you. Here is a picture of one of my Mums nestled in a furry Lambs Ear. 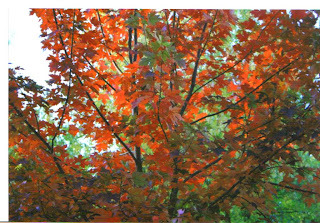 I finally got an 'Autumn Blaze' maple growing well in our yard. When we first bought our property, it only had one type of tree, the maple tree that drops those little helicopter all over the place. Ugh! And to make it worse, they have almost no seasonal changes. There is nothing in the spring or fall to look forward too. Their fall color is a very dull yellow, some years they can look pretty (like this year), but other years the leaves just turn a nasty brown, wither up and die. Anyhow, we have been gradually chopping these trees down as the need for firewood arise, and replacing them with other trees with more visual interest and less clean up: like crabapple trees, red maples, honeylocust etc. 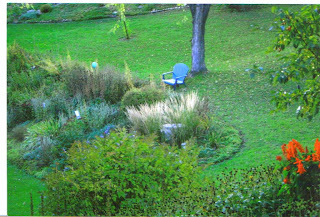 This is a picture of my yard with the same view as the photo behind my blog title at the top of the page; except this is the fall view, and the other picture is what this same area of the yard looks like in the spring. 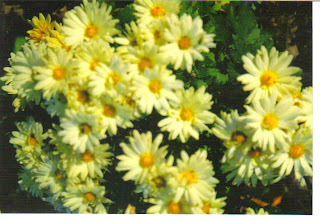 Another picture of a beautiful fall mum. What would I do without this fall plant to color my garden in the fall? Most of my crabapple trees bear gorgous fruit like this. 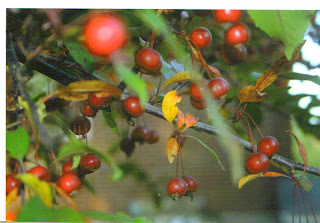 All winter, long after the leaves are gone, the bright red berries color my yard. In the spring, when the robins arrive, they eat EVERY berry off this tree. One time, I counted 20 robins at once in my tree. Within an hour, every berry was gone. It was so sad. The berries were so pretty. But I know the robins need the food. A view from the road driving up to my house. I love the ornamental grass and how it captures the sunlight in its 'flowers'. Its so pretty on a windy day especially. That is my garden shed in the background. This is a view from my front porch and kitchen window. I designed it specifically this way, so when I looked out my kitchen window while doing dishes, I'd have something beautiful to look at. 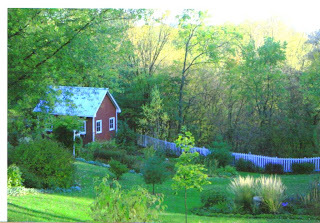 I hope you enjoyed my fall garden tour. I have fall pictures of beautiful Buffalo County that I will be sharing soon also. 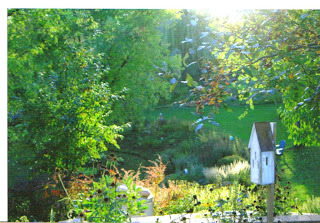 I will post more garden pictures as the season changes. Next up: Winter Garden Pictures! The yard is still pretty, even when blanketed with snow! These are Post-It-Note Holders I've made for a craft show this weekend. They were super easy and fun to make, and what a great idea too! So often I lose track of Post-It-Notes on my desk, because they are so small. Now, I will not only not have any difficulty finding them, but they are a nice decorative accent as well. The holders are also re-usable: the Post-It-Notes are glued on to the inside of the holder. When you've run out of notes, just glue a new pad in place. The Cat's Meow", and "Music Speaks"; all retired. 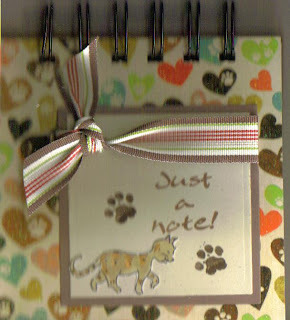 Embellishments like ribbon, brads, dew drops, etc., were added to every note holder. The front and back covers are chipboard coasters covered in various designer papers. I used my 'Bind-It-All' to bind the two coasters together. Need some quick and inexpensive gifts for your friends and family this Christmas? Or how about some Stocking Stuffers? Make some Post-It-Note Holders! I'm sure everyone will love them! I know I do! 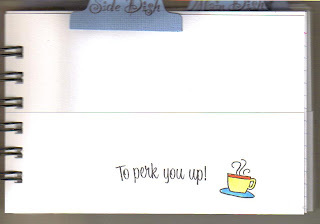 I made this card for a challenge on Splitcoaststampers where we were to use only one word on the front of our card and the color pink. I stamped the image on Stampin Up! 'Very Vanilla' Cardstock using 'Regal Rose' and 'Mellow Moss' Ink. The image is from the retired Stampin Up! set 'Blossoms Abound'. I added 'bling' to the card by using Heat and Stick powder and Dazzling Diamonds . The ribbon, pearls and the embellishment in the center of the flower are from the wedding section in Michaels. The prima matches the ink color in real life; for some reason it looks brighter in the photograph. The leaf is a punch from Martha Stewart. I distressed the edges of the 'Very Vanilla' cardstock and adhered it to a 'Regal Rose' card. This is my May 5 x 7 Calender. It fits in an acrylic frame. If you'd like to see a picture of the frame, see my January 5 x 7 Calender Post. Information on how to download the calender is also available there. The Cardstock is a Bazzil Pink, Georgia Pacific White, and Stampin Up! 'Tempting Turqouise'. The image is an old retired stamp from Stampin Up! called 'Home Tweet Home'. I colored it with Copic Markers. Be sure to check out the newest Holiday Release of Stamp a Sweet Impression at www.tayloredexpressions.blogspot.com/ Taylor has a lot of really cute cupcake, candy and generally 'Sweet' images. Perfect for the holidays! 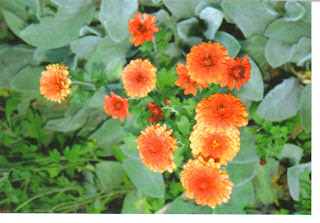 The Crafty Secrets Challenge on Splitcoaststampers this week was to make a card with orange and black on it using your Crafty Secrets Products. Well, I don't have any Crafty Secrets Halloween Images, so I used my 'Coffee and Tea' set; because I think the color orange and coffee go good together. Its a very clean, simple card. I used Stampin Up! Cardstock 'Very Vanilla', 'Pumpkin Pie', and 'Basic Black'. I used a Scor-Pal to score two lines on the left side of the card. 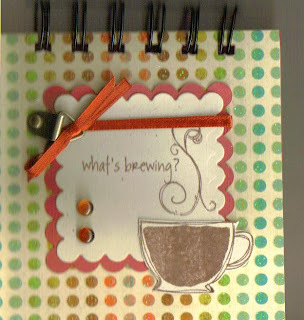 I stamped my own background using the coffee bean image in the set. I used rectagle nestabilities for the two main image panels. The coffee mug is mounted up on dimensionals and the images were colored with copic markers. Dew Drops were added for embellishment. I made this page for the Totally Random Blog, of which I am a creative team member for. The challenge was to created a page where everything had to be in the shape of a square. I had a lot of photos of my dear husband working in our yard, and I thought a geometric layout is perfect for masculine photos, so I decided to do a page dedicated to him. Many people say that my husband is the hardest working man they know. He works a 60 hour work week at a very stressful job, then comes home and works on projects around the house and in the yard during his evenings, weekends, and vacations. The unknown background paper has two different types of square images, one is vertical and one is diagonal. It also has a 'denium' look, which is a very masculine fabric. I used my computer to make the title, and added ribbon and two types of hardware for embellishment. This is my 4 x 6 Upright april Scripture Calender. It fits inside an acyrilic frame. See my January 4 x 6 Upright Scripture Calender post if you'd like to see a picture of the frame. The download information for the calender is also available here. I started with a light purple 4 x 6 Bazzil Cardstock Base. I cut my white cardstock a tad smaller and sponged the edges with Brillance lavender ink. I stamped the retired Stampin Up! 'Elegant Inspirations' and the new 'Inspired by Nature' set on the cardstock. I used my Stampin Up! Markers to color the image on the stamp before I stamped it. If you'd like to purchase the 'Inspired by Nature' stamp set or markers from me, feel free to email me or go directly to my website and order online. The color challenge on Splitcoaststampers yesterday was Stampin Up! "Pink Pirouette", "Kiwi Kiss", and "Chocolate Chip". I used my Stampin Up! 'Pocket Silhouettes' set for the main image panel, and I sponged the edges with both 'Chocolate Chip' and 'Pink Pirouette' inks. I embossed the 'Kiwi Kiss' panel with my Cuttlebug and 'Leafy Branch' embossing folder. I used my sewing machine to zig zag around the edges of the panel. I added primas, brads, and ribbon for embellishment. If you'd like to purchase this stamp set or any of these colors of cardstock and ink from me, feel free to email me or go directly to my website listed on the right side of this page to order online. This is my April 5 x 7 Calender Page. It fits inside an acrylic frame. If you'd like to see a picture of the frame, see my January 5 x 7 Calender Page Post. Download information for the calender is available there also. I used a light purple Bazzil Cardstock for the base. I stamped images from Stampin Up! "Spring Gifts" and "Wide Open Spaces", both retired and a $1.00 stamp from Michaels by Katie and Co. I colored them with copic markers and used chalk for the sky and around the sun. For yesterday's Technique Lover's Challenge on Splitcoaststampers, we had to make an inspirational, encouraging card with the color pink as the primary color in honor of Breast Cancer Awareness Week. We also had to use Twinkling H2O's on our project. If you've never heard of Twinkling H2O's, they are tiny little cakes of sparkly color. You add a few drops of water to them and they soften. Then you apply it to your image using a paint brush. They give a little hint of shimmer (you really can't see it in the photograph, but trust me, its there in real life!). You use Twinkling H2O's if you don't want as much 'bling' as you would get if you used Stickles or Glitter. Well I'm sure your probably all thinking 'This looks like the strangest scripture card I've ever seen", and it probably is! But when I thought of Patter Cross's Scripture Challenge Word last week, all I could come up with was humor, so I made a humorous card. In case you can't read the sentiment, it says "Its hard to be nostaligic when we can't remember anything!" The challenge word was 'Humility'. Patter said that ' True humility is all about God....Being humble allows us to accept the fact that we are inadequate and that we need to completely put our trust in God to enable us." I thought about all the times in my life when I've been humbled. Most of these times were when God asked me to do something I felt completely unworthy or unqualified to do. If I was obedient in doing what God asked, the results were always fruitful. It humbled me to know that God chose someone as insignificant as me to produce such wonderful fruit. But I'm also humbled in other, more humorous ways, one of them being the physical signs of aging. Although I am still only a little more than half way thru my lifespan, I've already noticed signs of aging and it got me to think of how the older we get, the more our reliance in God has to get, because we can't rely on our physical bodies anymore. When were young, were strong and healthy and think we can do anything, we don't need God's help very much (or so we think). But as we age, we need God's help more and more. I found this sentiment on the card so funny, cause as my husband and I age, I have noticed our memories already fading. I can't even begin to tell you how many times I've climbed the stairs in my house to get something and then forget what I went up the stairs to get! LOL! As my physical body starts to fail, I am humbled by the fact that I can't do everything on my own, and must rely on God. The card was made with the retired Stampin Up! set 'Words by Wanda". I colored the image with copic markers. I used Georgia Pacific White cardstock and Stampin Up! 'Tempting Turqoise' and 'Pink Passion' cardstock. I added a prima flower, brad and ribbon for embellishment. I hand doodled around the edge of the card. If you'd like to join us in a Scripture Challenge sometime, check out Patter's Blog. Its called 'Triple the Scraps', just click on the title on the right side of this page and it will take you there. Next week's challenge word is 'Serve'. 1. Link your tagger and list the rules on your blog. 2. Share 7 facts about yourself on your blog-some random, some wierd. 3. Tag 7 people at the end of the post by leaving their names as well as links to their blogs. 4. Let them know that they have been tagged by leaving a comment on their blog. 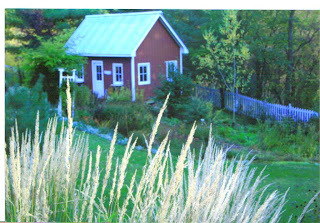 I was tagged by Deborah Saahanen and her blog is here: http://deborahlynnesdreamincolor.blogspot.com/. Thanks Deborah for tagging me! I visited your blog for the first time and loved it! I'm now a follower. 1. I live in the country, in a very small town. The nearest little town is 12 miles away. My house was built in the late 1800's by a man who also built the flour mill that started our town. So I call my house 'The Old Mill House'. 2. I hate hunting season. And thats really a challenge when I live in the best hunting area in the state of Wisconsin! We have trophy size Buck that hunters from all over the state come to try and kill. I just love nature and would much rather take a picture of it, than kill it! Its very difficult for me to see dead animals laying in the beds of pick up trucks and hanging from trees every year. Ugh! This past weekend I drove around our beautiful country to take pictures of the gorgous fall colors, and I couldn't believe the hunters that were EVERYWHERE! Its amazing anything is still living with the number of hunters in the woods! LOL! 3. I'm a born-again believer in Jesus Christ. I got saved during my college years. I was desperately looking for the love I never received as a child, and I found it in Jesus. 4. I'm very honest. This can be a good thing or a bad thing. Many people have told me that they love my honesty because they never have to wonder what I'm really thinking. But often it gets me in trouble too. I've had to learn to think before I speak, and I've gotten much better at it as the years go by. LOL! 5. I'm a very good friend. If I choose you as my friend, I will never forget your birthday, I will always be there for you anytime you need me, and I will be loyal to you. 6. I have a secret mad crush on Matthew McCoughnehey. (I'm not sure I spelled his name right. LOL!) Yes, my husband knows all about it, and he's fine with it. In fact, he loves it when I watch a movie that Matthew is in, because then he gets to reap all the benefits afterwards. LOL! 7. I use to be in the military. Thats always a shocker for everyone, because I am so feminine. I keep that part of my life very secret and I don't like to talk about it. In fact, my best friends don't usually even know. So if they read this post, they'll be in for the shock of their lives, I'm sure. LOL! I'll have some explaining to do! I read this R.A.K. Request on Melanie Muenchenger's blog this morning and she asked us to put it on all of our blogs. Marcus Russell is 17, and has been battling brain cancer for 2 years. He was diagnosed on Oct. 2nd of 2006 with a brain tumor and had surgery to remove it the very next day. He underwent chemo and radiation treatment and did quite well during that time. Marcus has been very active in marching band and church. His family, friends and community have been very supportive of him. 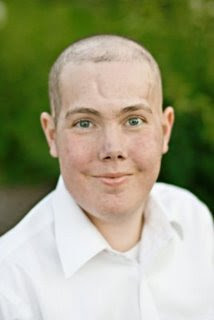 While on his Make A Wish trip in Hawaii in August, Marcus became very ill and it was then that they found a new tumor. Within a couple of week's time he developed multiple tumors throughout his brain. He started a brand new chemo treatment (which made him quite sick) and this last week the MRI showed that it wasn't working. He is already blind and unable to walk. They've been told he only has days left.When I asked Nancy what they needed, she said: “Just asking for prayers would be awesome. Prayers really do help. Back when we placed Jessica into hospice I got so many emails with good thoughts, prayers and love that I knew I would be okay. I also knew that God heard each and every prayer and those who offered up the prayers were also blessed.”Your prayers and RAKs would be amazing. I had one other idea that you might be able to help with: If you are able, would you consider putting Marcus's pic and part of this post on your blog? Can we let others know who he is, that he was here? When Karen asked Marcus what he would like the world to know about him and he said, "I am the dark night - I am batman". (When you read their blogs, you'll see they are always ready to lighten the mood with a joke, no matter the circumstances) Nancy says: "He is a man of few words and he doesn't even want to think about what to say. (But they were excited about this idea of posting his pic and gave it their blessing) "BTW, Marcus has always been a fan of batman and a WWII buff. (Family) recently took Marcus to an air force base and the airman presented Marcus with a helmet and other things. They were impressed with Marcus's knowledge of the jets and he even knew all about a new one that will be available next year." This is my March 4 x 6 Horizontal Picture Calender. It fits nicely inside an acrylic frame. To see a picture of the frame and download information for the calender, see my January 4 x 6 Horizontal Picture Calender post. Because its usually still winter here in Wisconsin during the month of March, I chose a winter scene of my yard for the photograph. The photograph can be easily removed and replaced with a new one because I used photo corners. This way, if sometime during the month I become 'bored' looking at this photo, I can replace it with a new one. The image is from the retired Stampin Up! set 'A Tree for All Seasons'. I stamped it directly on a piece of 4 x 6 white cardstock and colored it with my copic markers. I sponged the edges of the cardstock with Stampin Up! 'Bashful Blue' ink. I matted the photograph and the calender on Bazzil light blue cardstock. Its only 54 degrees in my house today. My hands are going numb as I write this. My husband ripped out our old oil furnace and is in the process of replacing it with in-floor heating, but he has no idea if it will actually work yet. Thank goodness we have a wood stove to provide some heat or we'd really be in trouble! If the in-floor heating doesn't heat the house well enough, we'll get by with our wood stove until we can get a gas furnace put in. This is my March 4 x 6 Scripture Calender. It fits inside an acrylic frame. If you'd like to see a picture of the frame, see my January 4 x 6 Scripture Calender post. Information on how to download the calender is also available there. I used the new Stampin Up! Set 'Seasons of Friendship' for the main image. This set is now available in the Holiday Mini Catalog. Its a wonderful set that I absolutely LOVE! It comes with flower, snowflake and leaf images so it showcases all the seasons of the year. I used this set for a winter image, since its often STILL winter in March here in Wisconsin! LOL! I stamped the tree in Stampin Up! 'Close to Cocoa' Ink. The snowflakes and bird are stamped with 'Bashful Blue' Stampin Up! ink. I sponged the edges of the white cardstock with 'Bashful Blue' ink also. The scripture is from the retired Stampin Up! set 'Elegant Inspirations' stamped in 'Brocade Blue' ink. The white cardstock and calender are matted on 'Bashful Blue' and 'Brocade Blue' cardstock. If you'd like to purchase this set from me, email me or go to my website. The links are in the right side column of this page. Every month the blog 'Sheetload of Cards' give you a new sketch. This is the sketch for October which I combined with the Way To Use It challenge on Splitcoaststampers. This weeks challenge was to use Plaid on your card. Well everytime I think of plaid, I think of warmth and comfort....great themes for a get well card! I stamped my 'Flannel Plaid' (retired) Stampin Up! Background Stamp on Kraft cardstock using Riding Hood Red ink. I used pinking shears on the Chocolate Chip Cardstock. I did some funky sewing on the cardstock with my sewing machine. I added this new felt ribbon from Stampin Up! 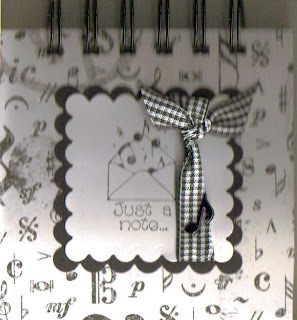 which is available in the new Stampin Up! Holiday Mini Catalog. If you haven't seen this ribbon before its amazing. Its made from felt and is so soft to the touch. It really reminds you of warmth and dressing warm for winter. A new must-have for winter cards. I then tied this ribbon thru a retired "Hodgepode Hardware" piece and mounted my main image from Hero Arts up on dimensionals. The circles were cut using my coluzzle. 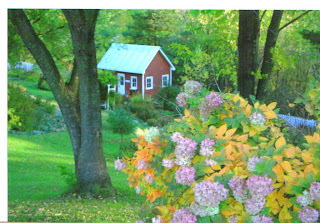 If you'd like to participate in the Sheetload of Cards Challenge go to this blog for directions: http://sheetload.blogspot.com/2008/10/show-us-your-sheetload-and-win-october.html Two winners will receive a $25.00 gift certificate to 'Clear Artistic Stamps Online Store'. If you'd like to purchase some felt ribbon or a coluzzle from me, either go to my website and order it online or email me. Details on the right side of this page. The Crafty Secrets Challenge on Splitcoaststampers this week was to create your own background paper using Crafty Secrets Stamps. I created my own background paper by stamping a piece of white cardstock with a stamp from the set 'Cherish'. I then colored the images in with my copic markers and put Stickles on all the flowers. The main image was also colored with copics and is mounted up on dimensionals. I added a pink silk ribbon for embellishment. This is for last weeks scripture challenge on Patter Cross's blog 'Triple the Scraps'. The weeks challenge word was "Light". The first bible verse that came to my mind when reading the word 'Light' was Jesus words to His followers "You are the light of the world. A city on a hill cannot be hidden. Neither do people light a lamp and put it under a bowl. Instead they put it on its stand, and it gives light to everyone in the house. In the same way, let your light shine before men ,that they may see your good deeds and praise your Father in heaven." I love this verse. I find it so humbling that God sees me, and all believers, as 'The Light of the World'. What an awesome responsibility too! How many times have I 'hid' what I really thought or felt because it was 'politically incorrect'. We are called to be a light to truth, and also a light for hope in a dark world. So Christians, let your light shine for all to see! To make the card I used my computer to create the sentiment. I then created a mask and used ink create the sunbeams. I basically just cut two angled strips of paper out of cardstock, and sponged Stampin Up! ink 'More Mustard' and 'Really Rust' inbetween them. Melanie has a great tutorial on how to do this on her blog 'Hands, Head, and Heart'. Just click on the link on my blog list on the right hand side of this page to find it. The 'arch' is designer paper. The bottom panel was run thru my cuttlebug using an embossing folder. The card base background is a sunset designer paper. All the mats are Stampin Up! 'Really Rust'. 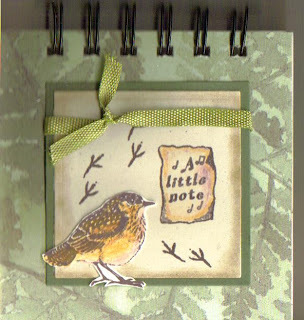 The Layout is yesterdays sketch challenge on Splitcoaststampers. I was thrilled to see it, because I knew it would be perfect for my card. This card was made for the Technique Lovers Challenge on Splitcoaststampers. I absolutely loved putting this card together. It was so much fun and very easy to do. All you do is cut a piece of sturdy cardstock to the size of 10.5 x 5.0. Score this cardstock at 1.25, 2.5, 4.25, 6, and 8.25. Now fold like an accordian and you have your card base. Decorate as you wish. Easy eh?The card could make the perfect holiday decoration too, because it sits so nicely. I made a Fall Stair Step card, using my retired Stampin Up! set 'Happy Fall Ya'll'. I colored all the images with my copic markers. I cut some of the images out and popped them up for extra dimension. I added raffia for an extra seasonal decorative touch. This is my March 5 x 7 Calender Page that fits inside an acrylic frame. Check out my January 5 x 7 Calender Page Post if you'd like to see a picture of the frame and the dowload information for the calender. I chose a spring theme, because even though we still get some snow storms here in Wisconsin during March, its that time of year when Wisconsinites 'LONG' for Spring and sometimes Mother Nature can surprise us with a few warm days. After the snow has melted, March is also a busy garden month for me. Thats the month I like to get outside and cut down all the previous season's foilage and clean things up a bit; and thats just what these cute little bunnys look like their doing to me, so I chose their sweet images for my March calender page. The images are from the retired Stampin Up! set "Spring Gifts", they are colored with copic markers. The sun is a stamp from the retired Stampin Up! set 'Wide Open Spaces'. I stamped a flower from the retired Stampin Up! set 'Delight in Life' on the calender itself. I used chalk to color the sky and a ring around the sun. Scraplings were introduced on the Hero Arts Blog just a few weeks ago. I would provide you with the link, but unfortunately I lost it. Basically, an artist that works for the blog had all these 'scraps' of cardstock left over and invented what she calls a 'Scrapling' out of her leftovers. Isn't that a cute title? They are approximately 4 1/4 by 1 1/4. They must have an adhesive standard size label and at least one embellishment on them to be called a 'Scrapling'. I think they will become the latest rage! Goodbye ATC cards, Welcome Scraplings! They can be tucked inside cards as an 'extra gift', or used as bookmarks or tags. I actually made my scraplings for a swap on Splitcoaststampers. I used all Stampin Up! cardstock: Real Red, Really Rust, Pretty in Pink, Green Galore, Blue Brocade, Brillant Blue, and Pink Passion. I used a variety of stamp sets, here they are in the order that they appear in the picture: MFT 'Hearts Galore', SU! "Its Snow Time", SU! 'Festive Friends', Hero Arts 'Cupcake Images, SU! 'Tu Tu Terrific", Hero Arts 'Happy Thanksgiving', and SU! 'Fruit of the Season'. I used ribbon, adhesive crystals, crystal effets, and brads for embellishment. I made this set for the 'Try a New Technique' challenge on Splitcoaststampers. You can find the tutorial for the box here: http://splitcoaststampers.com/forums/showthread.php?t=388026. I made the gift box, 4 note cards and matching envelpes. I used the retired Stampin Up! set "Fruit of the Season". I absolutely love this set. Its so timeless and elegant. The images were colored with copic markers and I put Crystal Effects on the fruit to make them shiny. The paper is Stampin Up! 'Real Red', and Georgia Pacific White and an unknown lime green. I used ribbon from Michaels. The tag was created with a cuttlebug die. The sentiment is from the retired Stampin Up! set 'Holiday Woodcuts". If you've never made a box before, I highly encourage you to give this one a try. I couldn't believe how easy it was. I've made lots of gift boxes before, and this one was indeed the quickest and easiest one I've ever made. I was so happy to see that this stamp set was not retired and made it into the fall/winter Stampin Up! Catalog. It comes with two other images, plus a pretty tag stamp that the images fit inside of. The other two images are of Mary, Joseph, and the baby Jesus, and a praying angel. For this card, I used a burgandy cardstock base and attached a sheet of metallic gold designer paper. I colored my image with copic markers. My sentiment is embossed with detail gold embossing powder and mounted up. I added gold lame ribbon and a gold star for embellishment. The star was cut using my cuttlebug and a cuttlebug star die. I embossed it in 'Jeweled Gold' embossing powder, then added stickles to the edges. I also put gold stickles on the wisemen's gifts. The star is also mounted up. If you'd like to order this set from me, just email me or go to my website. This is my February Horizontal Picture Calender. The picture can be easily removed and replaced with another picture. It fits into an acrylic frame which you can see in my January Horizontal Picture Calender Post. Information on where to download the calender is also available here. Because its the month of February, I focused on Valentines Day and picked a 'romantic' picture of my husband and I taken at Devils Lake Park in Baraboo, Wisconsin. The views at this park, especially in autumn, are breath-taking. I used unknown designer paper for the bottom of the calender. The top portion is plain, pink cardstock. I used my Martha Stewart "Lace Border" punch for the center of the calender. The image is the retired Stampin Up! Set 'Mon Ami' and is stamped in Stampin Up! 'Regal Rose' Ink. Yesterday I drove my son to Eau Claire, about an hour from our home. The sun was shining and I was in absolute heaven looking at all the gorgous fall colors. The views were amazing, and were not even in peak season yet! It was such a beautiful, inspiring, spiritual drive. Its times like these, when I don't mind the long drive at all when I have such beauty to look at. Hopefully this weekend I can get out and take some fall pictures. The Challenge Word for Patter Cross's Weekly Scripture Challenge last week was "Power". If you've never heard of the Scripture Challenge before and would like to visit Patter's Blog 'Triple The Scraps' to see what its all about, just click on her blog title in my blog list on the right hand side of this page. I'm always a week behind Patter's challenges, and rarely finish the first challenge before she posts another one! LOL! But anyway, LAST week Patter asked us to make a card that showed how His power is revealed in our own lives or in the Bible. The scriptures Patter chose were Nahum 1:3a "The Lord is slow to anger and great in power..." and Romans 1:16 "I am not ashamed of the gospel, because it is the power of God for salvation of everyone who believes'. The verse I chose for my card is from Phillipians 4:13 "I can do all things through HIM who strengthens me." For me, this verse shows the power of God in my life. I can't do anything on my own, (especially behave myself! LOL!) without the power of God in my life. I also used the mountain scene on my card because I believe the power of God is also shown in nature: the brillant sun and how powerful its rays are, the majesty of the mountains, the strength of tall trees, and the powerful bodies of water that can produce energy for good, or destroy anything in its path when nature unleashes her fury. Nature, to me, is a very visual example of God's power. The stamp sets are both retired Stampin Up!. The sentiment is from 'Elegant Inspirations' and the nature images are from 'Wide Open Spaces.' As I write this and am looking at my card, I realized I should have shown the mountains reflecting in the water. Oh well, my mistake. I colored the images with Stampin Up! markers and used chalk for the water, sky, and sun. I tied a piece of hemp on the bottom for a rustic accent. Next week's scripture challenge word is "LIGHT". I'm gonna love making that card! Imagine the possiblities! Hope to see you playing along. If you make a card, email a picture of it to me or let me know where its posted. I'd love to see it. I am a creative team member for the blog Totally Random which can be found here: http://scrapinspire.blogspot.com/. Every month we are given two scrapbook challenges that we are to complete for our readers to use as examples for their own scrapbook pages. One of the challenges this month was to "Use Creative Prompts On Your Page". Some of the prompts given to us were: 'I am wild about...', 'I am....', 'I wish I knew...', 'I believe in my heart...', and 'I secretly dream...'. I chose 'I secretly dream...' as my creative prompt, mostly because I had this thoughtful picture of myself that my hubby took that I knew would be perfect for this prompt! LOL! My title is in a 'thought bubble' and it says "I Secretly Dream". There are three smaller thought bubbles and those share some of the things I secretly dream about, but few people know about me (and if you can read the small print, I'm sure you all know NOW! LOL!). 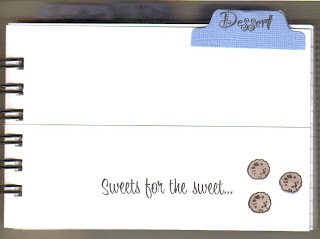 I added a sentiment stamp from the retired Stampin Up! set "Natural Beauty". I highlighted the word 'Dream' and put vellum over it to soften it. I added ribbon, primas and brads for embellishment. I sponged both the pink and blue designer paper with ink to make it more dream-like. Now, don't you all go telling people what I secretly dream about! LOL!